Newbury College set the stage for a glittering Prom Fair on Thursday 04 April, as school leavers across West Berkshire prepare for the biggest night of their social calendar. The event, which was supported by Newbury Weekly News and Parkway Shopping, attracted some big name exhibitors from the worlds of fashion, fitness and more to the College's unique, indoor marquee. School proms have become a cultural phenomenon in recent years, with preparations for the big night getting under way months in advance. For those young people who were still undecided about what to wear or how to wear it, the Prom Fair was an excellent opportunity to get clued up in the latest trends from Parkway stores Monsoon, New Look and Topman; discover timeless classics with Isabel's Retro & Vintage Clothing and receive expert advice on hair and makeup styling from Andrea King, CJ Beauty & Co, Holly Heimsoth Beauty, Pin It Grip It and Simply Hairlicious, as well as live demonstrations by Hair and Beauty students from the College's own Intuition Salons. Students from the Newbury College Performing Arts course, a new programme that runs in partnership with Kingsclere Performing Arts College, modelled a range of affordable looks, from classic suits and dresses, to more adventurous outfits for those who dare to make a statement. Local dressmaker and Newbury College dressmaking tutor, Kim Broughton, was also on hand to offer prom-goers advice on tailoring and customisation. Other exhibitors included Anytime Fitness, Cascade Events, Chequers Hotel, Dark Star Discos, Double Tree by Hilton, Regency Park Hotel, Infinity Roses, Lucy Booths, NightLights, Nuffield Health, Rosie’s Retro & Vintage Studio and Sweet Stories, all offering their services to help make the moment memorable. Naomi Cripps, Marketing Manager for Newbury College, said: "This is the first time we have run an event like this and it was fantastic to receive the support of so many big brands and local businesses. "It was an excellent opportunity for us to showcase the talents of our students, as well as our indoor marquee, which transforms the Sports Hall into a unique venue for weddings, parties and other celebrations. "Newbury College is well-known for offering an exceptional range of opportunities for school leavers to continue their education through career-focussed courses and apprenticeships. The Prom Fair is just one more way we are supporting young people and local businesses in our community." To find out more about the opportunities available to school leavers at Newbury College, hiring the indoor marquee or to book yourself in for a pre-prom treatment in one of the College's training salons, search Newbury College or visit the Monks Lane campus. Newbury College held its annual Apprenticeship Awards as part of National Apprenticeship Week on Thursday 07 March. Organised to coincide with National Apprenticeship Week (NAW), apprentices, employers and College staff came together to recognise the achievements, hard work and commitment of all those involved with its apprenticeship programme. Host for the evening was Principal and Chief Executive, Iain Wolloff. “The awards ceremony is an opportunity to promote the value of apprenticeships as a fantastic route into many different careers,” explains Iain. “The variety of employers who attended the event demonstrates that apprenticeships provide a great way for businesses to nurture talent”. Chloe Bowley, winner of Best Apprentice in a Medium Business, said: “I’m honoured to receive the award. It was not expected, but I couldn’t be happier that I was chosen. All the hard work I’ve put in is finally starting to pay off and it feels surreal that I’m weeks away from being signed off my apprenticeship completely, after a truly challenging 16 months. The awards were sponsored by; Newbury Weekly News, Parkway, Roc Technologies, Mitie, Newbury College and Dawnus Construction. Newbury College holds monthly Apprenticeship Information Sessions, where candidates can find out more about the apprenticeship vacancies on offer. For organisations looking to take on an apprentice, the College has a long history of helping businesses run successful apprenticeship programmes. Read one of our case studies at www.newbury-college.ac.uk/apprenticeships or contact our Business Team on 01635 845229.
International Women’s Day encourages the world to reflect on the importance of gender equality, to celebrate the successes of women, and to acknowledge the work that is still left to be done. Newbury College celebrated the success and achievements of its female students and staff via a special social media campaign for the global movement. Many classes and activities were also dedicated to researching the contribution that inspirational women have made to our society and exploring the careers and progression routes available in today’s world of equal opportunities. Using the hashtags #iwd19 and #newburycollege, the further education provider featured the inspirational women who both work and study at the College, including members of the senior management team, tutors, technicians and support staff. Newbury College has a proud history of promoting equal opportunities within its staffing and its curriculum. One of the very first students to attend the college when it opened in 1948 was Sheila Smith, an engineering apprentice from Plenty (now SPX Flow Technology). Sheila left the Newbury Girl’s Grammar School Sixth Form to join a traditionally male-dominated industry. After completing her apprenticeship, Sheila went on to study an HNC in Engineering and later taught Technical Drawing at Newbury College and Park House School. Newbury College inspires women of all ages to experience more and achieve more through a wide range of vocational and technical courses from accountancy, creative arts and hairdressing to forensic science, sport and engineering. The College also offers a vast range of one-day courses for adults and businesses starting from just £30. December 2018 - We are delighted to announce the appointment of our new Student Governor, Sophie Hemsley. Sophie joined Newbury College from The Clere in Burghclere, in September 2017 to study L1 Catering and Hospitality, driven by a passion for catering from an early age and impressed by the industry standard training kitchen at the College. 08:00 - Arrive at College and head to The Street Diner for a Starbucks to kick start the day. I tend to get into the Restaurant early and begin polishing the cutlery ready for service. 09:00 - I pop out for a Maths lesson for an hour and then head back to the Restaurant to help set-up the tables, stock the fridges and polish the glasses. 10:00 - Tasks rotate every week; either cooking or front-of-house, this ensures we get experience of all aspects of catering and hospitality. Today I’m in the kitchen, its December so we’re cooking Christmas dinner with all the trimmings. All items are prepared from scratch. 12:00 - Service starts. We plate the food ready for the waiting staff, serving between 30-50 people per sitting. Once we finish in the kitchen we go and help front-of-house with clean down. 15:30 - I head home and have a rest before starting work. I work 4 times a week as a chef at a local pub and love the fact that I have actual experience within my course. It has made it a lot easier to adapt to life in a professional kitchen. Sophie is also a Pearly Princess, and having celebrated her 18th birthday, takes the title of Pearly Queen in 2019. December 2018 - Lynne Stafford of Thatcham received an extra special festive surprise this week, when she heard she was the winner of the Newbury College wordsearch featured in the Newbury Weekly News Christmas Guide. She was delighted to hear that she had won £30 worth of vouchers, towards a part-time course at Newbury College. Lynne commented, "It was a real surprise to have won the competition, as a childminder I often do the puzzles with the children but this is the first time I’ve won. I am looking forward to browsing the options and trying something new in 2019”. Over 40 businesses took part in the annual West Berkshire Work and Careers Fair at Newbury College on Wednesday 7th November, providing an opportunity for organisations to network and showcase their employment opportunities to students and jobseekers. As well as meeting with the exhibitors and discovering the opportunities available, visitors to the fair were also able to obtain advice on apprenticeships, tips for successful job hunting and attend 1-2-1 CV workshops with Adviza. Dawnus Construction, who are currently building the Highwood Copse Primary School at Newbury College’s Monks Lane campus and medical technologies company, Stryker, also offered interactive workshops covering the employment opportunities within STEAM industries from the College’s Engineering Solutions Laboratory. Participating organisations included a wide range of employers and training providers including local universities, Vodafone, Metro Bank, BUPA, Sovereign, Mencap, WBTC, Healthwatch, Berkshire Labels, AWE, Roc Technologies and many more. Exhibitors enjoyed an opportunity to network over a complimentary business breakfast, sponsored by Local Buzz magazine, before the main event opened to the public, supported by Job Centre Plus, West Berkshire Council and West Berkshire Skills and Enterprise Partnership. Sky Curtis, who studied Music Technology for three years at Newbury College, has been awarded The Vice-Chancellor’s Scholarship, by the University of Portsmouth. The scholarship is awarded to students who achieve very high grades for their Level 3 qualification. 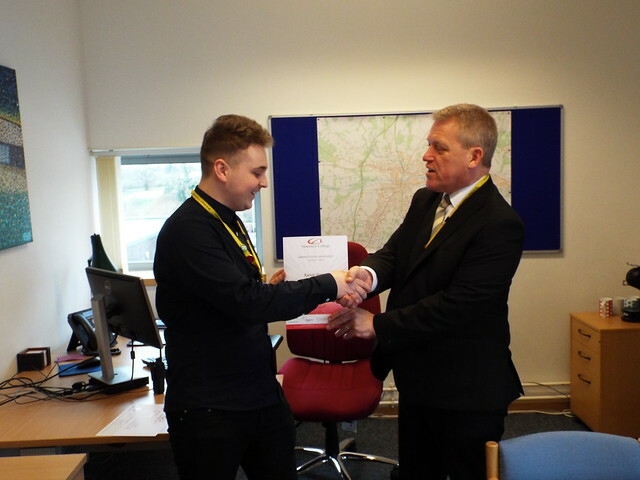 Sky commented, "I’m extremely happy to have been awarded the Vice-Chancellor’s Scholarship. This is in no small part due to the dedication of my tutor, Matt Foster, and the music technology subject team at Newbury College. Thanks to the College’s support and their belief in my future aspirations. This award will make a big difference in my ability to further my music technology education." Newbury College offers a wide range of Music, Media and Dance courses with full time Music Technology courses at Level 2 and Level 3. To find out more, visit the College Open Event on, Tuesday 6 November between 4pm - 8pm or explore the courses page. Former and current staff, governors and students of Newbury College attended a special event on 04 Thursday 2018 for the opening of an exhibition celebrating 70 years of the further education provider. The exhibition, which showcases the history of Newbury College through stories, photographs, news articles and memorabilia, was attended by a host of invited guests including Dr Anne Murdoch OBE, former Principal from 2001 to 2018, Jan Cover, Mayor of Thatcham and Tony Allen, former Chair and member of the Corporation from 1997 to 2015. Former Newbury College alumni also joined in with the celebrations and provided memorabilia for a special cabinet of curiosities, including Mrs Elkins, who studied with the College in 1953 and Roly Wise, who started his Newbury College journey as an apprentice before enjoying a long and successful career within the engineering department. The exhibition is open to the public throughout October at the West Berkshire Museum and will be rehomed at the Newbury College campus on Monks Lane for the remainder of the year.